I did another class yesterday at Kraft Crazy in Tidworth using the new colours of alcohol inks. I made the projects bright and summery to really show off the new colours and the sun came out for one day at least in honour of the occasion! The card below uses a technique I found on Patti Behan's blog where she has a video tutorial showing how you can use alcohol inks to make an animal print - very clever! I love all the new colours, especially the brights, much more my colour range than the original selection (even though I've used them loads as well). 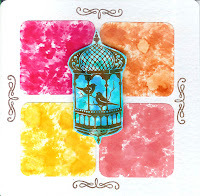 Also love the birdcage stamp from Elusive Images on the middle card.